Fruit Basket with Moet Chandon Imperial,chocolats and flower decor! Champagne Fruit Baskets give the gift of luxury in Rome,Italy! Give someone special in Rome Italy this beautiful Moet Champagne Fruit Basket with Chocolates and let them know just how much you care. 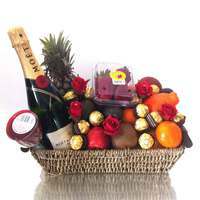 It's a delightful basket full of fruit and the sparkle of Moet with the added sweetness of chocolate, ideal for all occasions Anniversary, Get Well, Christmas, Wedding, Valentines, Birthday and every occasion in between.